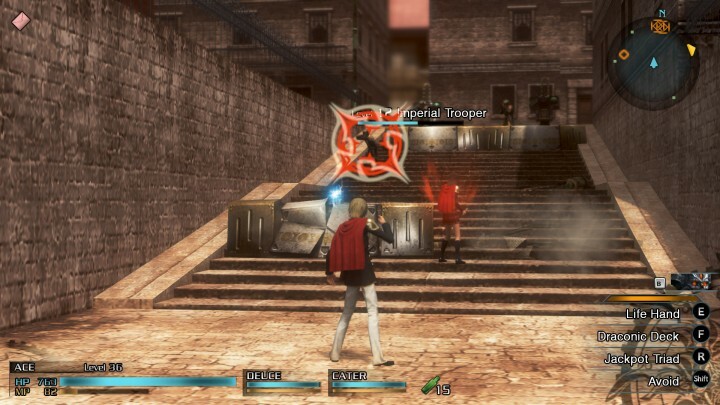 Final Fantasy Type-0 HD is an enhanced remake of the 2011 PSP game, with improved visuals and gameplay tweaks. Even as a spin-off of the main Final Fantasy series, it tries its best to be just as ambitious and full-featured as its numbered brethren. It somewhat succeeds in this with its innovative battle system, exciting missions, and variety of gameplay modes. But unfortunately, the fragmented story-telling, pace-killing filler sections, and questionable design choices tarnish an otherwise worthy Final Fantasy experience. The game starts off with a bang, throwing you right into the middle of an all out war between two countries. As the Militesi Empire overwhelm’s Rubrum’s defenses, it quickly becomes clear that this is a much grittier game than other Final Fantasy entries, with blood spatter and gory deaths amidst drab, devastated landscapes. Just as all hope seems lost, Class Zero enters the fray, wielding powerful magic and turning the tide of a losing battle. You play as Class Zero’s entire 14 member roster, each bringing their own set of unique abilities tied to an equally unique battle system. While combat starts off feeling clunky and overwhelms you with a plethora of options and menus (ala typical Final Fantasy style), it’s still great fun right off the bat. 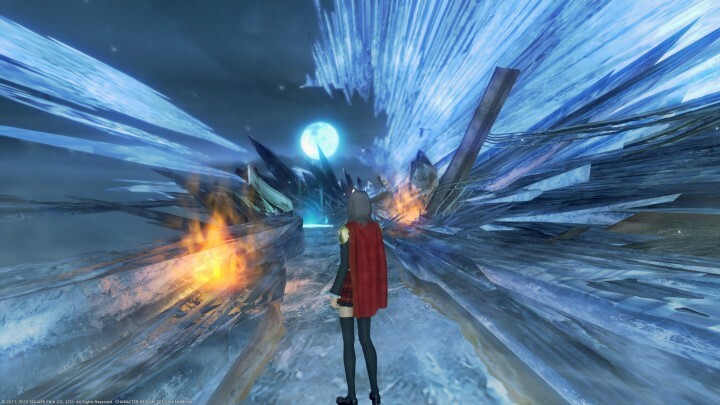 Final Fantasy Type-0 plays more like an action game akin to Crisis Core, with fast, real-time combat that includes, dodging, blocking, and combos. Each of the 14 playable characters has different weapons and skills, and they all change your battle strategy in their own way. Jack’s katana is extremely slow but can kill in one hit, while Cater’s magic pistol rewards patience with powerful charge shots. I really enjoyed exploring each character’s style as I constantly mixed and matched them to create new party setups. The absolute highlight of combat is the breaksight/killsight system. But the absolute highlight of the entire battle system is the breaksight/killsight system. These are flashing markers that appear when an enemy is in a vulnerable state, rewarding proper timing of attacks with massive damage or instant kills. Even until the end of the game, I never got tired of dodging an enemy’s assault at the last second, exposing their breaksight, then unleashing a devastating counter of my own. I hope future Final Fantasy games will take some inspiration from this feature. 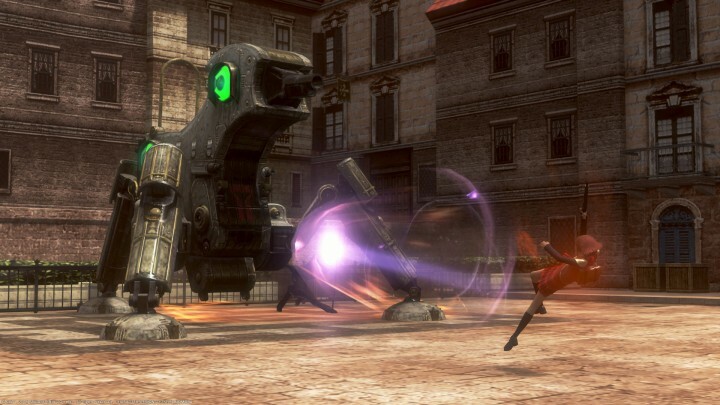 Besides the fantastic combat, the beginning of the game plods along at a snail’s pace. The story is very slow to get started, as in most JRPGs, as it spends a great deal of time introducing its large cast and providing background on the rich world of Orience. But, that just results in the first few hours of gameplay being filled with mostly cutscenes, text boxes, and running around between objective markers. Interestingly, an early gameplay mixup happens with the RTS-like city capture mini-game. 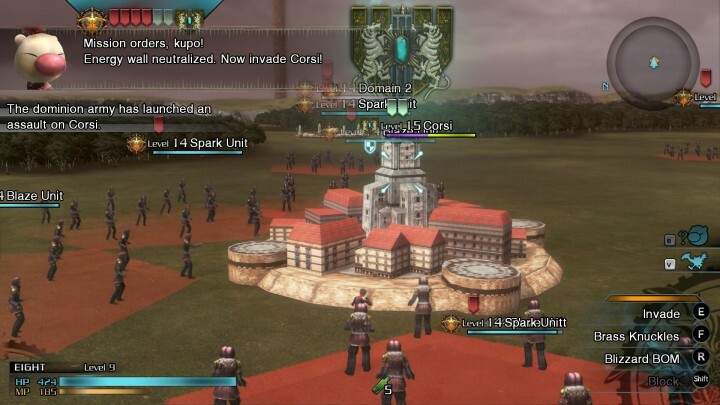 In this mode, you command armies to retake Rubrum territory, fighting off enemy squads and capturing strongholds from the world map. You can also deploy troops to advance the front lines, and dive into bases for regular combat to take it over. It’s a light and fun-enough gameplay addition that has potential. 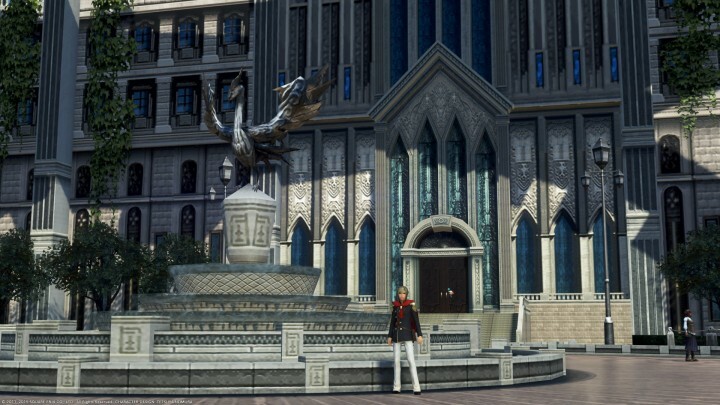 You’ll spend most of your time between story missions inside the school campus of Akademeia. This area acts as a hub, deploying Class Zero on missions against the Imperial forces or assigning random filler tasks. It’s unfortunate that the mundane side quests greatly outnumber the satisfying and well-designed story missions, since they’re mostly uninspired and feel like MMO-style grinds to kill X enemies or get X item. What’s worse is that side quests are basically required in order to advance the story due to an odd time mechanic. You’re given a set number of hours before the next main mission, and side quests tick down the timer. This design choice really slows down the pacing of the game with hours of filler content between plot missions. Another disappointment that sticks out early is that there isn’t much character development for most of Class Zero; you rarely get any insight into their pasts, personalities, and motivations. Most of how you get to know who they are is through a text-based archive record. It seems like an afterthought, and the cast’s interactions are mostly superficial, with no real bond felt between the members. Instead, they’re mostly filling roles from the standard anime character checklist, e.g. the meek kind-hearted girl, the brash youth with a hero complex, etc. However the combat system still shines through, opening up even further with summons and the phantoma upgrade system. The summons are really fun and always exciting to use because they cost one character’s life to activate. You have to decide when to call on their absurb power and who to sacrifice — although at this point if you’re like me, you’ve already decided on which party members are your favorites and which are expendable. Each summon has their own set of abilities and experience levels, so they feel like party members that you’re developing too. The phantoma system is for upgrading magic, and it adds a thoughtful layer of powering up your characters beyond mindless grinding. 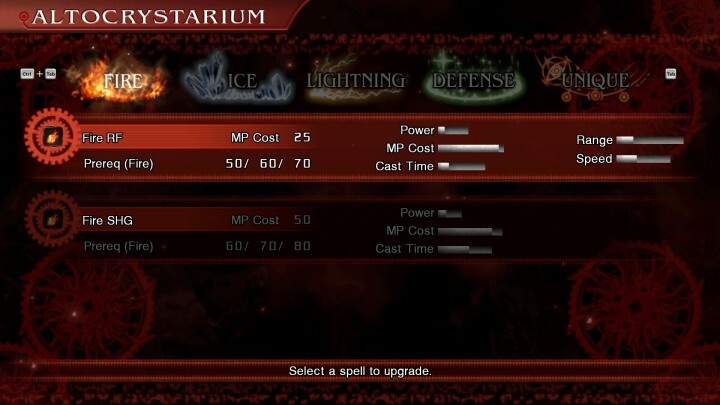 You receive different colors and rarity of phantoma by defeating enemies, and each magic spell costs different amounts of each type to enhance. I often found myself going back to previous areas to find just a few more of the rarer phantoma so I could get one more upgrade. It almost feels like a crafting system, and it’s a nice balance between collection mini-game and skill management. 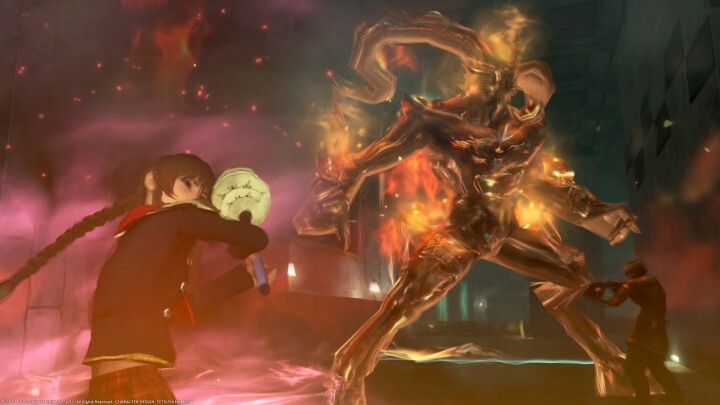 With summons, phantoma upgrades, and a whopping 14 characters to level and upgrade, the combat stays fresh and basically carries the enjoyment of Final Fantasy Type-0. You’re constantly unlocking new combos, skill variations, and mobility options, and the battles just keep getting more fun. 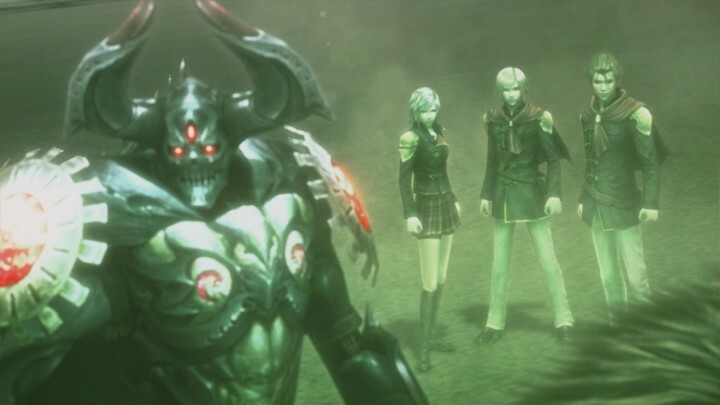 Final Fantasy Type-0‘s story picks up the pace here, flinging you into tense scenarios instead of simply going on assigned sorties. The story missions are really fun, with different objectives, map layouts, and intimidating bosses all providing a different experience. The set pieces feel pretty epic, like escaping a heavily guarded city while being bombarded by missiles, and fighting on a moving train. It also feels like there’s actual weight behind Class Zero’s actions, and you can see the direct results of each victory as the Militesi Empire is pushed back through well-done narration and cutscenes. The plot is finally engrossing, and it’s on a grand scale filled with political intrigue and ulterior motives — like how a Final Fantasy should be. Class Zero also begins to highlight each member as individuals, but just a bit. Their personalities clash as they struggle to make decisions as a group, and some members start to step out on their own. They’re still mostly a band of character tropes, but at least they’re contributing to story dialogue now. This might be the worst section of Final Fantasy Type-0. Not only is there a lack of new content, either story- or combat-wise, but the amount of filler is also cranked up to frustrating levels. 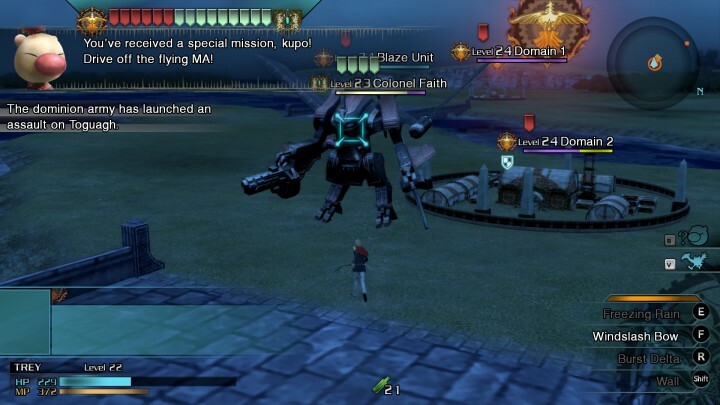 The timer between each story mission is extended by a large amount while simultaneously requiring a big character experience jump for the next mission. The end result is grinding — lots of grinding. The game seems designed this way to artificially bloat playtime, but it kills the story’s momentum completely. There’s grinding — lots of grinding. There is one new addition to gameplay: the return of the RTS mini-game, now with boss battles to mix things up. However, these boss battles don’t add any strategic depth, and end up just being button-spam events. 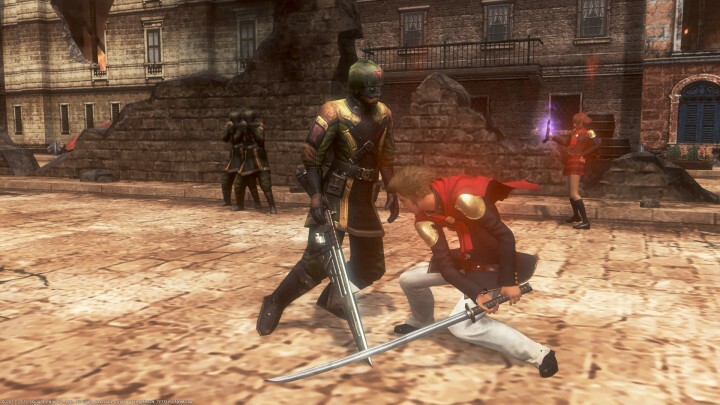 Fortunately, after the previous dry section of gameplay comes Final Fantasy Type-0‘s best moments. The main story missions have always been consistently great, but things get even better here. Class Zero is separated in combat for the first time, forcing you to choose how to divide your party members to take on multiple assaults. The battlegrounds for these missions are the most beautiful and unique in the game, and they’re packed with fun battles and engaging objectives. 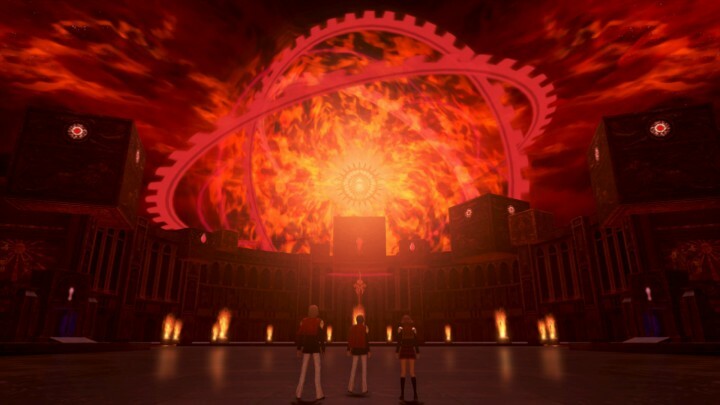 Even after hours of gameplay and nearing the finale, Final Fantasy Type-0 shows that when it tries, it can still deliver an amazing RPG experience. 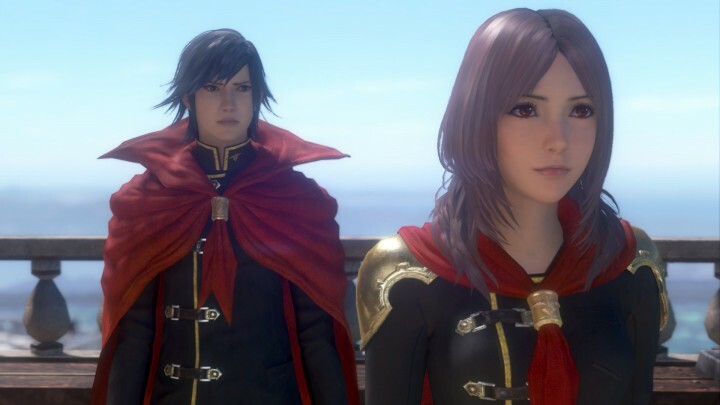 Here are Final Fantasy Type-0’s best moments. Complementing the gameplay is a sudden flurry of plot advancement. In fact, it honestly took me by surprise how immersive Final Fantasy Type-0 became at this point, given its lackluster period just a few hours before. There’s non-stop momentum for several hours and across multiple missions, leading to the most stunning series of events thus far in the story. 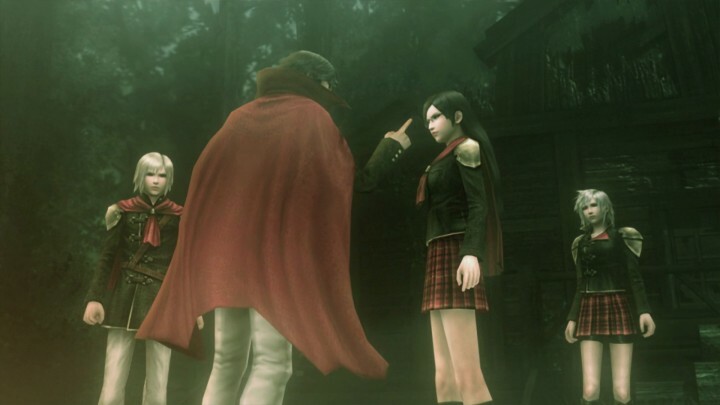 Sadly, Final Fantasy Type-0 ends with a whimper. The anti-climactic “final showdowns” with the enemy feel very rushed and unpolished, and they’re a huge contrast to the well-designed and fun main missions just a few hours ago. There’s a bland RTS campaign that leads to a dud final fight, and another mission that’s nothing but a 2-3 minute boss fight. Souring things even more, there’s a sudden jarring turn of events in the last chapter — unimpressively depicted via still images — that introduces a completely new threat with no buildup. Due to this, it was hard to invest in the endgame, even moreso because the final dungeon is just a boring collection of square rooms and plain hallways. There is a New Game+ Mode that encourages you to replay the game to unlock new story paths, but it wasn’t enticing enough for me to pick up the grind again. I opted instead to just replay a few of my favorite missions to relive the experience and collect a few goodies that I had missed the first time through. If anything, this is a testament to how fun the main missions and battle system are. 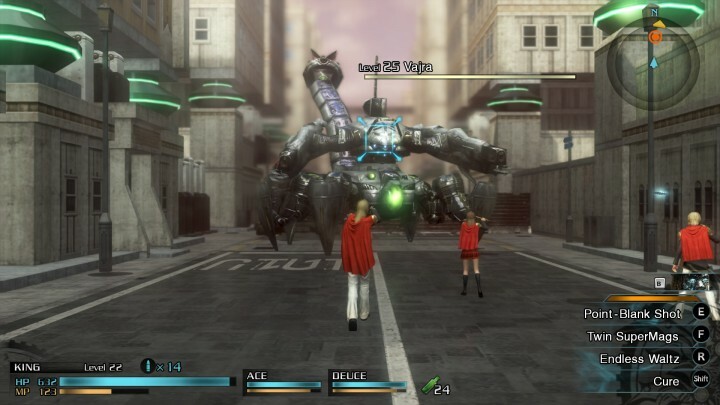 Final Fantasy Type-0 is a quirky game. I applaud its attempts to be different from the typical Final Fantasy, with a completely new battle system and an interesting take on the standard RPG themes. It’s grittier, flashier, but also messier than the main series — but that’s exactly what makes it stand out too. I certainly hope to see something like the breakpoint system in other RPGs, and with a bigger budget I think the branching storyline could really work with more exposition, an expanded world, and better character development. 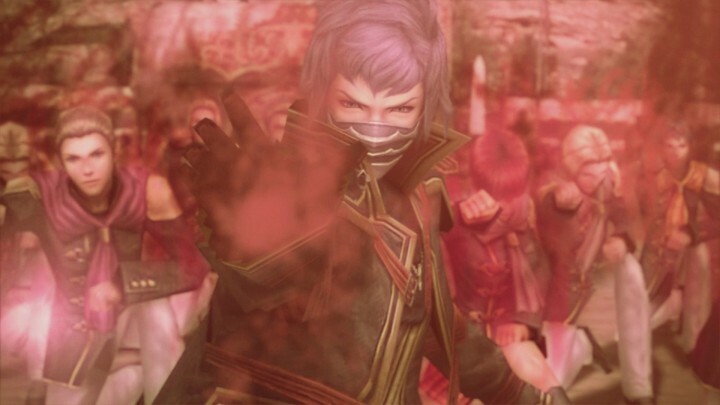 But overall, Final Fantasy Type-0 is an ambitious game that deserves another entry to refine its flaws — and I greatly anticipate that next game.